So sorry it’s been a while since I’ve posted, but life happens. We have successfully moved into a brand new built 4 bedroom house and the kids have gone back to school, and boy am I glad that all that is done with! Moving ourselves was a lot of hard work, but we had some great friends who really helped us out. Now that our days are falling back into a routine, I should be posting more regularly. This summer definitely felt like a whirlwind to me, but the one constant was my CSA delivery and a hungry family to feed. I’ve still been getting weekly CSA deliveries of farm fresh organic produce from Lazy Creek Farm and doing my weekly meal planning around them, but the wonderful farmers surprised me with some extra beets and cucumbers from there bountiful garden as a thank you for my blog posts that have generated some extra business. With about 10 pounds of cucumbers and a bunch of beets on hand, I figured it was time to delve into canning. Luckily, I have made a pretty close friend here in Astoria who is also a chef and has experience canning, so we jumped in and made some pickled beets, bread and butter pickles, and some pickled grapes while we were at it. 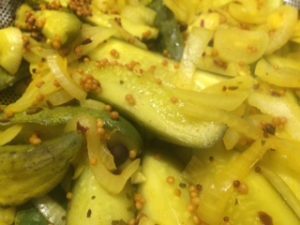 Things were going pretty well with 2 of us working at it, and we were taking the obstacles as they came…like running out of mustard seed and substituting whole grain mustard to make another batch of pickle brine. Cooking by taste instead of just following a recipe definitely comes in handy and is a philosophy shared by Chef L and I. So the kids were playing, and we were processing the pickled produce as well as you can with 6 littles running around. My first adventure in canning was more fun than work, and we ended up with quite the haul to put in the pantry. 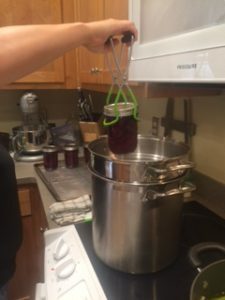 I did miss the end of the process of water bath canning the beets to get the lids to seal as Baby hurt her eye and I was on the phone with the pediatrician. So, I left Chef L to finish up canning and with 5 kids in my house to take Baby to the ER…see I told you she was a good friend! 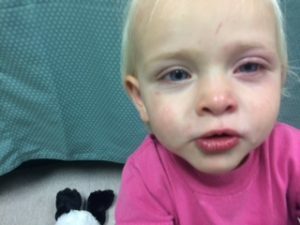 Luckily, Baby’s eye was not permanently damaged, but she had managed to get a corneal abrasion while playing. The next day she was back to her normal self, except for putting up a fight when it was time for antibiotic eye drops. 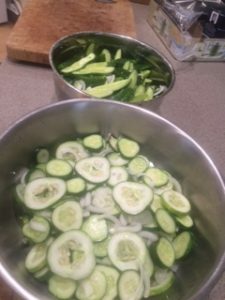 At the end of the day, we ended up with 7 pints of bread and butter pickle chips, 7 jars of pickle spears, 4 pints of pickled beets, 7 pints of pickled grapes, and 1 jar or refrigerator pickled onions from them leftover bits from canning pickles. The pickles are delicious, I’ve been eating them straight out of the jar. I had never even heard of pickled grapes until Chef L said about making them, but they were the perfect mix of sweet, salty, and spicy with a vinegary kick to make an awesome chicken salad sandwich ( my lunch today actually). Although, I would have to say that the leftover (i.e. Mussgo) pickled onion bits on top of a grilled hot dog are by far my favorite thing we made, but that’s this Mussgo Momma’s style! I can’t wait to can again! I received a huge bag of carrots from the CSA this week in addition to my regular delivery, and Chef L and I are hoping to get together next week to try out a jam recipe using the carrots. 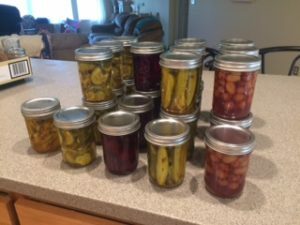 3 Responses to My first adventure in canning! Canning is fun! Pickled Grapes? Please post the recipe😀 One of my favorite reference books for canning things is a book title “Putting Food By”. Apparently its been around forever but there are recipes in there for things I never thought of! The pickled grapes recipe is not one of my own, but was from this cookbook…https://www.amazon.com/Pickles-Pigs-Whiskey-Recipes-Favorite/dp/1449428800. I think we added some ginger and black peppercorns that the recipe didn’t call for. This cookbook is full of great canning, pork, and southern recipes! Canning is definitely a task that gives me such a rewarding feeling when I’m complete with it…. I love filling up my shelves with freshly canned goods 🙂 I’ve never heard of these pickled grapes either but I may have to try them! My canning process always gets interrupted too with all my littls running around too! Hope all is well with the baby!! !